Happy Hump Day, folks! It’s been a while since we’ve sat down to do an interview and that makes me sad. So, this past weekend, I got the chance to chat with Larisa of the Pink Pigtail Inn. We spend some time talking about bit about blogging, WoW, and the MMO genre. It was a fun interview. Thanks very much to Larisa for making time for us in her busy schedule! Without further adieu, let me hand you a flagon a fine ale from the Pink Pigtail Inn’s private reserves. Cheers, and on to the third in our Community Spotlight series: Larisa of the Pink Pigtail Inn! GBN: Hi, Larisa, and thanks for sitting down with us today. Let’s get right into it. Tell us a little bit about the woman behind the blog. Larisa: If you met me on a street I don’t think the first thought that crossed your mind would be: “That woman looks like a gamer, I bet she plays WoW”. Judging from the outside I’m a well adjusted woman in the 40s, holding a good position in the PR area, married since forever and a mother of two teenage daughters. However, under the surface, I’m a bit of a geek, with a background in the Science Fiction fandom, and a dedicated LoTR reader since I was young. And I think this is what makes me feel so much at home in the WoW community. It’s more mainstream than it used to be, but in the end there are a lot of nerds around here. GBN: I’d definitely agree. Can you take us through a day in the life of Larisa? Where do gaming and blogging fit into the mix? Larisa: I lead a pretty ordinary adult life. Get up, go to work, get home, have dinner with the family, talk with the kids, maybe give them a ride if they’re going somewhere or watch some TV together. If it’s one of my raiding nights, I’ll log onto WoW before we start at 8 pm and then keep playing until 11.30 with just a ten minute bio and say-good-night-to-the-family break in the middle. Blogging is something I do whenever I get a little bit of time over. It can be in the morning, during my lunch break, after work, after a raid or in the weekend once I’m done with the household stuff. I’m always trying to maintain a balance between WoW and RL that is acceptable to myself and my family. GBN: I’ve been a fan of your blog for a while now. I really like how there’s a bit of in-character interaction going on. How did the idea for the Pink Pigtail Inn come about, and has it met that original “vision” many of us have when we begin? Larisa: When I started to blog I had a very vague idea about what a blog was, why I was doing it or where I was heading. I was just curious about the medium and I wrote about whatever came into my mind, without any intentions in either direction or expectations that anyone would read it. And even if I’m a bit less clueless now, the content isn’t all that different. The image of an inn came to my mind after I had been blogging for a couple of months and decided to switch language from Swedish to English which required me to get a new web address. I thought about the name I asked myself what blogging meant to me, and that’s when the image of the virtual pub popped up. I discussed it further with a game friend, who suggested the name, and since I liked it, I went for it. I have never intended PPI to be a strict in character role playing blog. Mosts of my posts aren’t referring to the inn at all; it’s basically opinions and reflections on what I’ve been up to in game or recent news in the community. 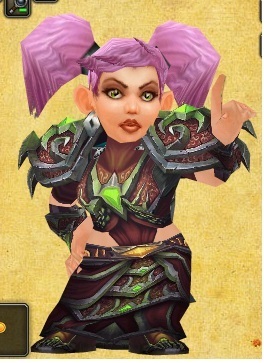 It’s Larísa, the player who is speaking, not Larísa, the gnome. But sometimes I toss in a little word here or there referring to the image of the inn. I’m bringing out toasts, I invite readers to have a seat, I hand over a pint or I sit by the fireplace, resting my legs after a hard raiding week. It all comes very natural to me as I imagine myself in this inn as I’m writing my posts. Blogging for me is to hang around in a bar after work, chatting with friends and strangers about our days and what’s up in the world. A place to relax. And this vision is pretty much the same now as it was two years ago. GBN: That’s great. I feel the same way; my blog is a little corner of virtual real estate where people can come to relax and talk about our hobby. I notice that many of yours posts don’t follow the “adventure diary” format. How do you decide what you’d like to write about? Is there anything in particular you really enjoy covering? Larisa: The only restriction I have on my blog is that I only write posts that have some sort of connection to WoW, MMOs or gaming. You won’t find any pure real life posts or political posts at the inn. But within that frame, I’m free as a bird. I don’t stick to a certain class or perspective such as “PvP” or “Raiding”, and I don’t have any ambition to be informative or useful. It happens that I write about things that I encounter in the game, but I also comment a lot on things going on in the community, especially the blogosphere. Whatever thought that crosses my mind, whatever piece of news that catches my interest. It’s quite random to be honest. The posts that I enjoy most to write are the one that are sprung out of a strong opinion or emotion. This adds a certain spark to the writing and it always gives me a feeling of relief when I “get it out of my system”. GBN: I know that you typically only discuss WoW on your site, but do you play any other games or own any of the big consoles? I’m interested to know whether it was WoW that made you a gamer, or whether you were a gamer that found WoW. Larisa: Oh. You got me there. I feel a bit embarrassed to admit it, but the truth is that I’ve hardly played any other game than WoW. My played list consists of a little bit of Lemmings and a couple of sessions with Civilization, apart from helping out my kids with some pre-school games that were supposed to learn them reading and counting. I remember clearly how I freaked out when I realized how immersive and time consuming Civilization was and that I thought that I couldn’t engage myself into such a time sink. Little did I know about where I would end up! It was definitely WoW that made me into a gamer, if you’re allowed to even call yourself a gamer when you only play WoW. I can’t rid myself from the feeling that I’m not a real gamer, but merely a tourist on a temporary visit. GBN: Wow, I’m surprised. If you’re a big fan of WoW though, you’re a gamer in my book! Since World of Warcraft is your main game, let’s talk about that specifically for a little bit. When did you realize that you loved the game? Did you have an ah-ha moment or did it creep up on you? Larisa: It crept up on me and I can’t tell you a certain moment where it “clicked”. It’s been such an amazing journey all the way from my first stumbling steps in game, when I had no idea about how to control my character or what a spell was, until where I am now – a dedicated 25 man raider. I think the first occasion when I shouted to my family “OMG, come here, come here, you really have to see this game, it’s freaking awesome!” was when I took train between Ironforge and Stormwind. What a thrill! I was dead scared that I’d fall off, but at the same time I was thrilled and laughed with enjoyment. GBN: What kind of character do you play and what keeps you coming back, rather than rolling an alt or switching games? 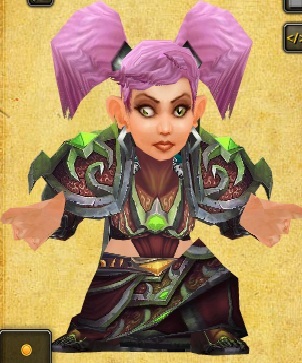 Larisa: I play a pink pigtailed gnome mage and she has been my main forever. I have a couple of alts, but no one that is so important that I’ll put a huge amount of time into it. Every since I began I’ve chosen to focus most of my gaming time into one character, developing it as far as I can, learning how to master it, and it’s the same with my choice of game. I stick to WoW in the hope to eventually become decent at what I’m doing. It’s all based on the fact that I have a competitive mindset, while I’m new to gaming and unfamiliar with things that normal gamers take for granted. My learning curve has been huge, to say the least. The best strategy to climb it faster was make a choice and stick to it. What keeps me hooked to WoW though is mostly the social aspect. Being in a good guild has a huge impact, as well as being a part of the WoW blogging community. If I didn’t have my guild or didn’t blog, I’m honestly not sure I’d still be playing. GBN: As the big dog on the playground, WoW tends to take a lot of flack from the wider community. At this stage, do you think WoW is an asset to the genre or a limiting factor on developer risk-taking? Larisa: I can understand the concerns about unrealistic expectations from investors who will rather go for a bad copy of WoW than take a chance of something new and innovative. And it’s always easy to bash the market leader, but on the whole I’m convinced that WoW, with its flaws, is a huge asset to the genre. What is a multi-player game if you don’t have any players in it? WoW has increased the market immensely and managed to reach out to a new audience, players like me who might be willing to try out other games in the future when WoW has lost its attraction. It’s for good and for bad, but definitely mostly on the positive side. GBN: Now, we all know that no game is perfect. So, if you had the choice, what two features would you make sure carry through to Cataclysm, and which would you leave behind? Are there any older systems you’d like to resurrect or banish forever? Larisa: I wish you could somehow reverse the trend of gear inflation. I don’t mean you should go back to how in vanilla (as I’ve been told, I wasn’t even playing at that time). However I think it has become a bit too much of it in Wrath. I enjoyed the challenges of beating the 5-man instances in TBC dressed in blues, but in Wrath we hardly saw anything of this because we outgeared them every so quickly, epics falling from the sky like rain. They’ve said that they’ll bring back CC as essential for the dungeons in Cataclysm, and I hope they’ll carry on with this idea. I miss the mega-pulls of Shattered halls and Shadowlabs, when you couldn’t aoe them, but had to banish, sheep, trap and find all sorts of cleaver ways to handle the pulls. It made the life of a dps:er way more challenging and interesting than it is today. One feature that I have mixed feelings about is the X-realm LFD feature. At first I thought it was brilliant, but now that I’ve seen the downsides of it and realized what a huge impact it has on the game and I’m not so sure anymore. It basically destroys the server communities and it takes WoW further on the path of being a solo game rather than an MMO. The game shows more and more of a one-night-stand mentality, which I find rather appalling. I’m afraid though that it’s too late to turn back now. GBN: As the MMO genre opens its doors and explores new business models, more and more companies are deciding to opt for microtransaction shops. WoW, in many ways, brought this to the average gamer’s attention with the Celestial Steed mount. Do you think WoW will continue this trend? More importantly, how far do you think it will go? Larisa: I think we’ve just seen the beginning. It’s a pattern I recognize from other related areas in the entertainment genre, where you for instance pay for songs rather than buying an album. Personally I don’t like it at all, since I play WoW to relax. Having all those choices, being expected to evaluate and take decisions about what to buy or not to buy makes me tired rather than excited, and if it’s pulled too far it will definitely push me away from the game. I prefer the flat fee subscription model any day. But I’m afraid the market thinks differently, so this has come to stay. The last few months Blizzard has pushed this further and further, and that’s what they’ll keep doing as long as WoW exists. The older the game gets, the more will they look for new sources of income to compensate for the lost subscriptions. GBN: Okay, last one. Fast forward five years into the future. Where are you– still playing WoW, moved on, or something else? What is the MMO landscape like and what big changes do you think we’ll see in WoW (if you think it will still be around)? 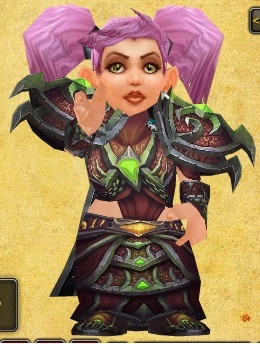 Larisa: Honestly I can’t imagine myself playing WoW in five years. The question is if I’ve replaced it with some other MMO, such as the secret project that Blizzard is working on. I may have done it, but I’m not sure. Don’t misunderstand me – I love playing WoW and I’m really glad that I gave this a chance and let it be an important part of my life. But life is only so long and there are other things calling for my time and attention too. I tend to do this – pick up a hobby, do it intensely for a few years, and then switch to something else. But I wouldn’t be categorical about it. You never know. Is WoW still around by then? Most definitely. I’m not so sure it’s growing – probably the opposite – or that there are still huge expansions being produced, but as long as they can make a profit keeping some servers open, I can’t see any reason why they wouldn’t. It should take more than five years to kill a giant such as WoW. I refrain from making predictions about how the MMO landscape will look. I hope it looks awesome though! Being the optimistic geek I am, I won’t settle until the MMOs have reached holo deck quality! GBN:Thank you for spending some time with us today. It was a fun interview and we’d love to have you back sometime! I hope you enjoyed this interview as much as I did putting it together. I always get a little thrill out of interviewing my favorite bloggers. If you have someone you’d like to see spotlighted, shoot me an email and let me know! Excellent interview. It makes me wonder if there is a higher percentage of female (WoW turned me gamer) than male. Great interview, thanks for making it! Now that is a great interview! Larisa was one of the first (and actually I think ONLY) Stormrage-EU bloggers I ever met! Unfortunately it was just after I’d moved to Bloodhoof. and my users would genuinely benefit fromm a lot of the information you provide here. and aaid others like you helped me. WoW!! Thank you for sharing details.